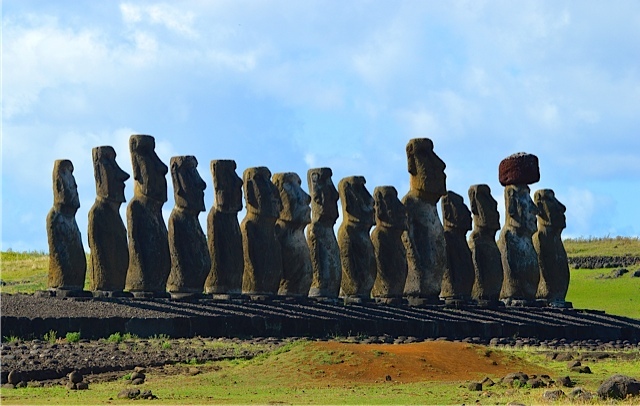 As I wrote earlier (see The Trip: Easter Island & Antarctica), the time we spent on Easter Island was a revelation to us. Tho it was an ‘add on’ to our Antarctica trip, it turned out to be a fascinating few days. 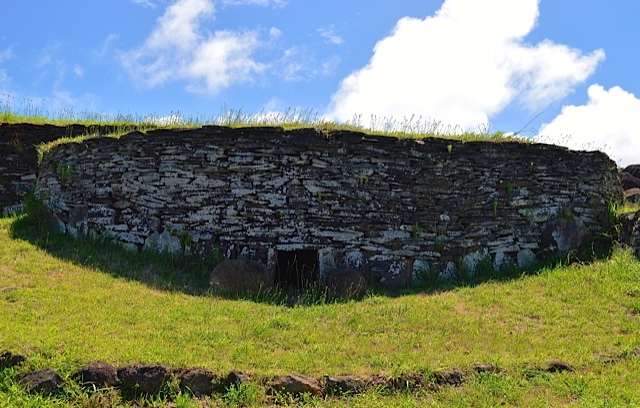 I’m posting here a few of Ellen’s photos from that part of the trip and then linking below to her full slide show of Easter Island (Rapa Nui). We’ve sorted the photos into five groupings, which cover the most important and most interesting sights. 1. Rano Kua (The Crater) & Orongo – The crater of this now extinct volcano use to be one of the few sources of freshwater on the island. Some statues were carved here. 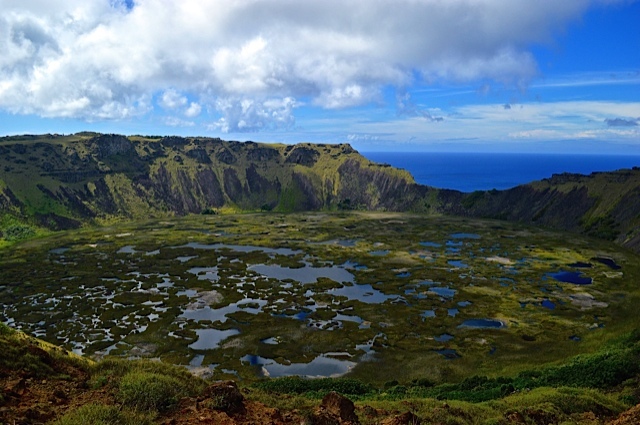 Near the crater is Orongo, a ceremonial village overlooking the ocean. The village was the site of the “Birdman contest” (to obtain the first egg of the season from an offshore island and thus be named that year’s Birdman, who was given special honors, privileges, and status). 2. 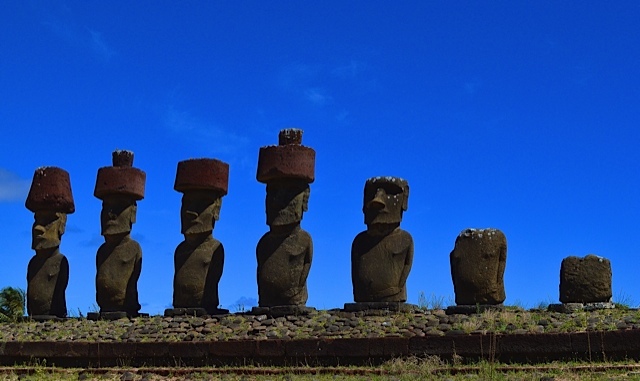 Ahu Tongariki – Probably the most photographed and recognizable symbol of Easter Island. 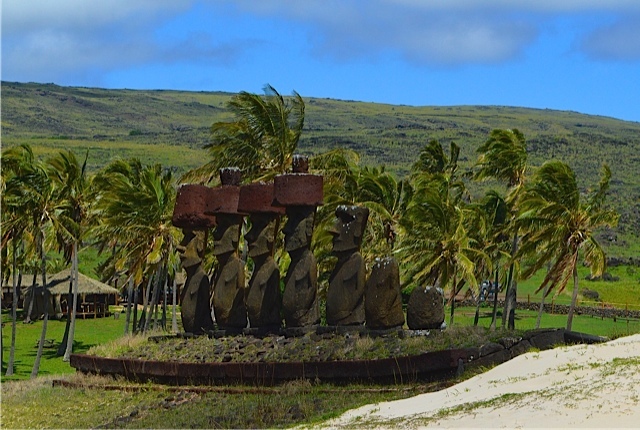 The largest restored (1992-96) ahu with its 15 restored moai are here. 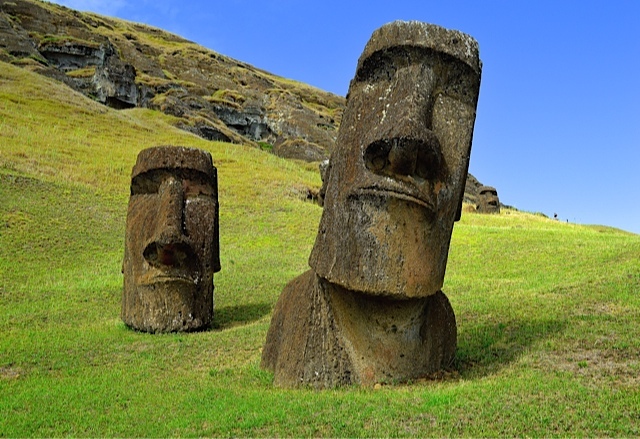 They represent the best example(s) Rapa Nui stone carving. 3. 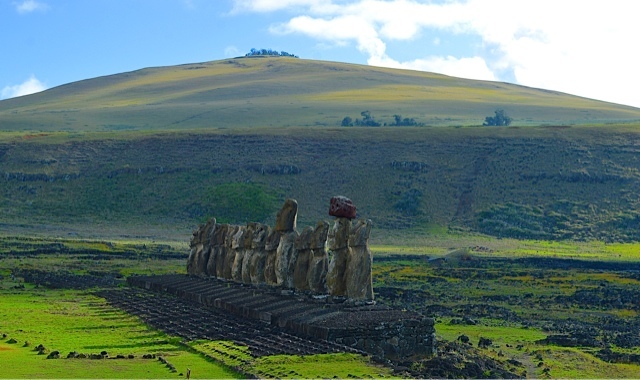 Rano Raraku (The Quarry) – The site from where most of the moai originated. They moai were carved here from hardened volcanic ash, softer and lighter than the basalt, which can be found all over the island. 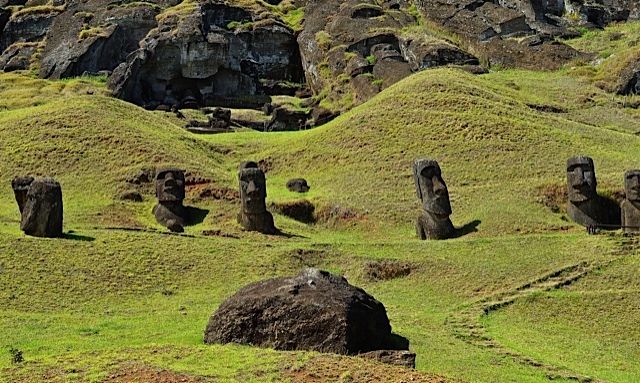 There are almost 400 moai here, and it’s possible to see the statues in various stages of carving. A fascinating site/sight. 4. Anakena – The bay where the first Polynesians likely landed and now a beach for swimming. There are three platforms here, with Ahu Nau Nau probably being the best example of preserved moai (because they were pushed over and buried in the sand until restored in 1978). Four of the seven have a pukai, a huge cylindrical headdress known as a “topknot”. Also, the white coral moai eye that is in the island’s museum was found on this site. 5. 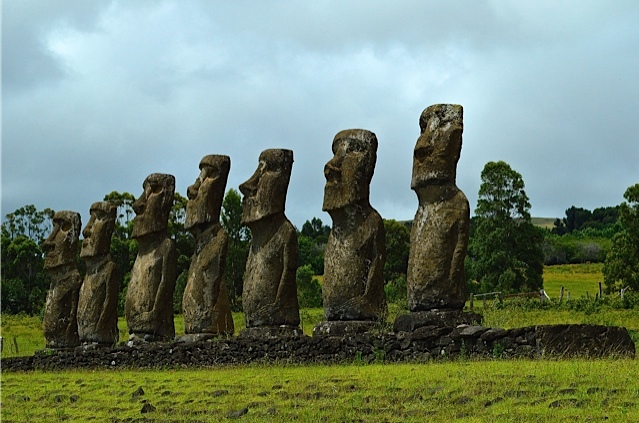 Ahu Akivi & Tahai – Akivi is the site of the first restored platform (1960) and has seven statues. 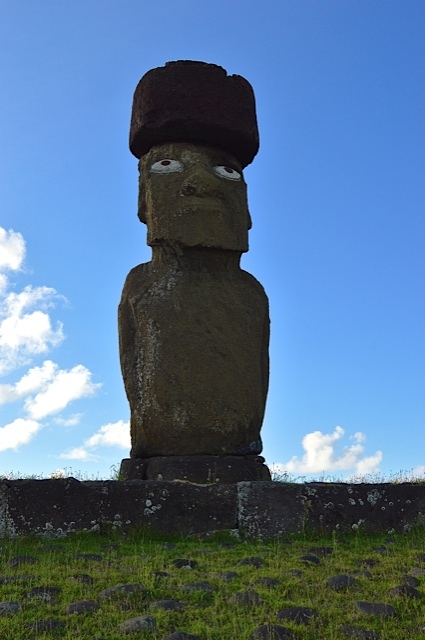 Tahai has three platforms (restored 1968-70) and includes one very large moia with a replica set of eyes and a pukai, a “topknot”. To see more of Ellen’s photos from Easter Island, open This Slide Show Link on a laptop or a desktop computer to see them on a full screen (the bigger your screen, the more you’ll enjoy the photos). Be sure to click on the small rectangle box with an > in it at the top right of your screen, just under where it says, “55 Photos.” The pictures above are far more intriguing when they are enlarged in the slide show. You guys are so generous sharing your photos and explaining everything so carefully. I appreciate the quality of the pictures and the beauty and … mystery — that’s definitely there. Thanx Carrie, Romana and everyone else who has responded to the postings of Ellen’s photos about these two trips and the accompanying notes. Your Comments are important and encourage me (us) to continue posting. To be able to share the good fortunes we have, the wonderful trips, and all the other things that appear on MillersTime adds meaning to the experiences themselves beyond the pleasures we get from them. Thank you both, Ellen for her stunning photos of a land I will never visit but love seeing and hearing about.